You might want to turn the lower A arm pivot bolts around. You won't be able to remove the passenger side bolt without removing the exhaust down pipe if you install them that way (the bolt should go in from the front). 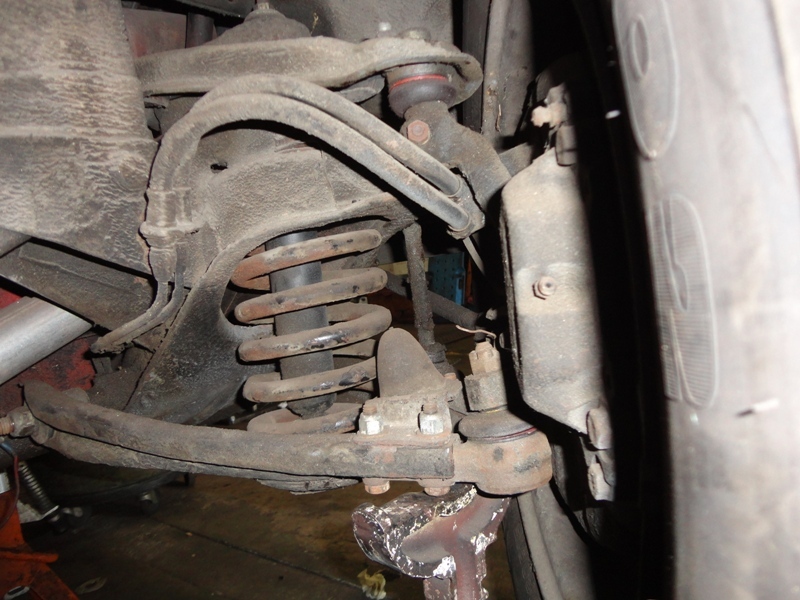 Last edited by didenpx; 11-15-2013 at 06:14 PM..
Got the replacement lower control arm bushing from FCP and pressed it in using my handy-dandy Jawhorse 1 ton vice followed by some kinetic "persuasion." Both control arms now loosely mounted (and thanks again to Hiperfauto for alerting me to the bolt issue....it was even worse than that. I was rushing to make some progress after work and actually had both of the lower control arms mounted on the wrong side because I lost track of the orientation of the cross member...duh! All sorted now). 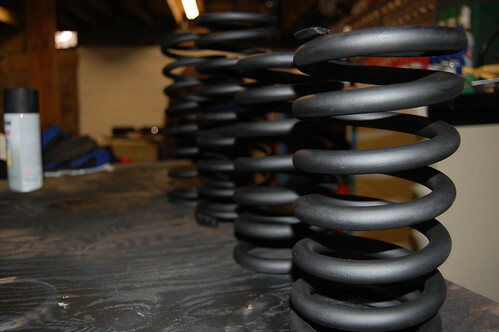 Also completed the trade of my OE springs for a set of vintage IPD sport springs. Hope to get the springs blasted and maybe even a coat of paint on tomorrow after work. 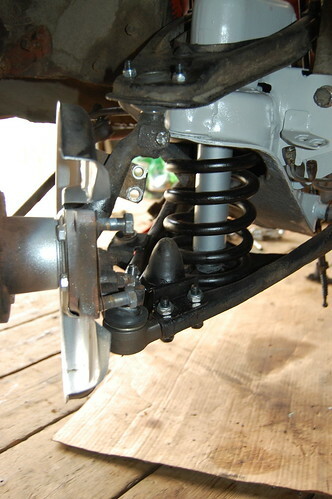 Photos tomorrow....and some questions about differences between the two front springs. Finally got time to work on this again. Made a lot of progress. 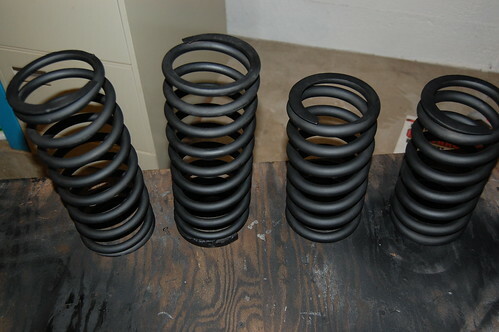 Since last post I blasted, primed, and painted the IPD springs. Shots below are in primer. Top coated them later with Rustoleum semi-gloss black. You'll note that there are no calipers. The ones that I bought at the local parts place (of course) don't fit. Will be returning them tomorrow and commencing a search for proper ones. Despite having zero brakes (hand brake is also out) I decided to go for it and with some help I rolled it from the upstairs of the barn into the basement garage. Was pretty exciting since the initial part of the trip is on a decent grade. I found out that even without an engine it's kind of hard to resist the momentum of a couple of tons of steel rolling on rubber. Thanks to a handy snowbank and some nifty footwork it all worked out just fine. Not 100% I'm going to like the ride height with the IPD springs. Time will tell. 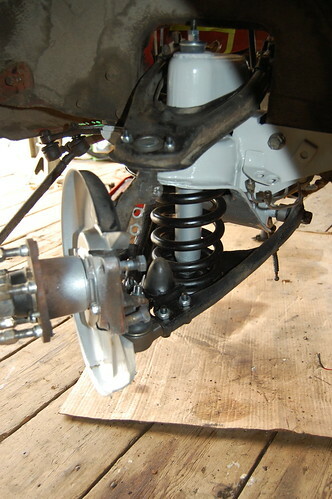 The rear should sit a bit higher after I rebuild that end of the suspension; as pictured here it's got the IPD springs and no shocks (they're in the budget for next month, probably). This is where it will sit for a while. Going to get it up off the ground, start pulling apart the rear end, drop the gas tank, and get started on the underbody welding. Already have the radiator cross member from Eric (Planetman) and it is a great quality piece and looks like it will be an excellent fit. Definitely time to figure out how to weld! Single digits outside. Nor'easter. Hovering around 34 degrees in my unheated basement garage; seemed like a good time to make some progress. 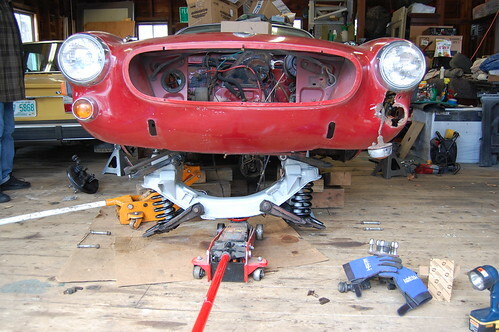 Since the last post I got the car up on jack stands and have been pecking away at prepping for and fitting the front radiator cross member support. Don't have photos of all of this work but I've cut out the rotted sections of the front frame rail sections on both sides and they are more or less ready to be patched. I'll be putting in about 1" to 1.5" patches here (details to be determined by better understanding of the repair panel fitting. I also have sanded/blasted the underside of the front cowl (bottom side of where all the spot welds were drilled out to remove the rotted out cross member) and put on a coat of zinc cold galvanizing paint to give it some protection. I've got all of the old junk and rot out and have dry fit the repair section a couple of times and it seems to be a very good fit. My big concern at this point is my ability to pull of the plug welds without making a huge mess (see below). I had a bit of rot through at the forward edge of the inner fender on the passenger side where it goes down to meet the frame rail and also ties into the inner cowl. There are a tremendous number of factory spot welds in this area and I decided to simply patch over the section, put in a couple of plug welds towards the forward edge, and then seam seal and undercoat it when done. Obviously I'm not proud of the result. I can live with and make it work but my skills need to improve before I try the radiator cross section plug welds. You can see on the right side of the patch that I attempted a few plug welds. They are ugly. I tried to move around in a circle ending toward the middle of the pre-drilled hole but it looks like I just blasted molten crap into portions of the hole. I think part of the problem might have been that I didn't have the patch tight up against the backing I was trying to weld it to. What bugs me more is the weld that's detailed in the last photo (bottom of the panel). I'm just trying to weld the frigging patch to the structure beneath it but even after adjusting the voltage and wire feed speed downards twice it seems like I'm getting adhesion to the structure underneath but more or less blasting through the patch material (which here is from leftovers of a 240 floor pan patch piece). If anyone can give me advice here I'd appreciate it....I'm going to attack it again tomorrow. What type of welder are you using, looks like flux? yes, Lincoln welder with flux core wire. No shielding gas. Is the zinc coating intended to be under a surface that will be welded? I ask because I always hear guys talking about using specific "weld-through" primers. Where is your ground clamp for the welder being placed? Is it on clean steel, and as close to the weld as possible? Also, just keep the battery disconnected while you are welding on the car. The shielding gas would make the welds noticeably cleaner. But, if you are using good flux-core wire of the correct size and have the heat/speed settings dialed in, then you shouldn't be getting the pigeon poop effect. I'll ask around a bit. Also, when I think about how easily and cheaply you could take that downstairs area from 34 to 54, I have to laugh and reflect on where you got your stubbornness from. Zinc on the back of the patch. Ground clamp was on clean metal about 6" from the patch. Getting an arc wasn't a problem....getting it to do something useful was. Does that particular area need a patch over it? Is the patch intended to strengthen or conceal? It looks like minor "rot" there. Stop welding over zinc. The fumes are toxic. The pigeon poop appearance suggests that the weld is cold. Turn the heat/power on the machine UP. Many of the guys believe that flux core wire and thin sheet metal will yield poor results, especially for a novice. They recommend using solid core wire and shielding gas. I do have a gas regulator for that welder. Stop trying to run a bead and just do individual spot welds, one at a time, spaced apart to avoid warping the metal. Gradually fill them in. Actually, instead of me retyping all of what they said, why don't I just link you to the thread? Just put your flame suit on because the fellas sure got some laughs from this, as did I. That being said, I sure as heck couldn't do any better at this time! There is advice, not just jokes. Just put your flame suit on . TB regulars already have one. (flame suit) Welcome Bull! This vid is exhaust not body panels but gets the idea across. As far as tack, tack tack. I'm a poor welder but have fun trying. If your having fun that's what matters, and not killing yourself or others. I checked the GarageDicks thread....humbling. I guess everyone who already has achieved automotive ninja status must hang there. I think I will snag your gas regulator and make another attempt with solid core. And I guess I should find a bunch of scrap and do some serious practice on that before I attempt more on the car.....you know how that goes against my very nature. Thinking maybe that I will start working on the rear suspension and brake rebuild and spend some time during those intervals to figure out the welding part. That or just give up on it and pay someone to do it for me (though that would still leave me clueless, feeling defeated, and way over my budget). Was -10 here this morning so it's too frigging cold to do anything right now. Will cogitate for a while and determine my next move. Still licking my wounds from my abortive effort at welding. Decided to make some progress where I could while I decide whether to tackle the welding myself or not. 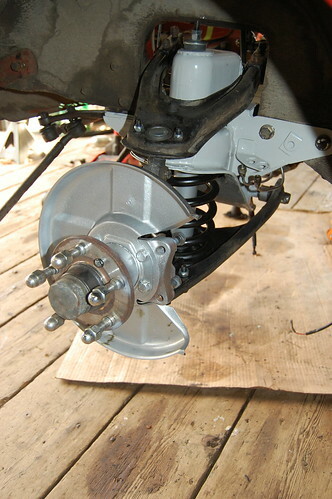 Bought rebuilt front calipers from Eric (Planetman) at High Performance (http://hiperformanceautoservice.com). 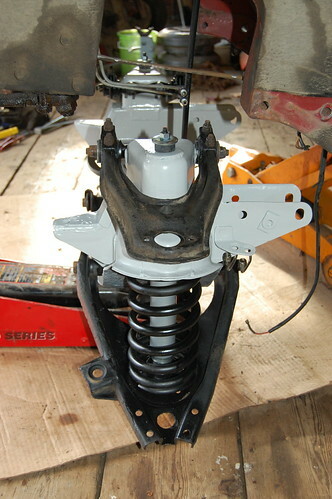 With a set of OEM pads and shipping they were about $230.00 and shipped really quickly. They arrived yesterday and are really nicely refinished and all of the casting marks (the "G" etc.) are very crisp. Much better than your average aftermarket rebuild jobs; very happy with them. I got the caliper and lines all sorted out on the passenger's side and have the caliper and pads mounted on the driver's side. If I get motivated I'll get the lines on the driver's side done tomorrow. You may notice that the pins holding the pads are in backwards in the photos (at least I believe they're supposed to be inserted from the back of the caliper); fixed them after the photos were taken and I noticed what I'd done. FYI, you have the brake hoses routed incorrectly. Here is a picture of the correct hose routing. Also, your brake hoses look old and they may even have undercoating on them. If they do have undercoating on them that means they are the original hoses!! In case you need them, I have braided steel brake hose kits and in a variety of colors. Dammit! Oh well, I'll sort them out. Thanks for the photo of correct routing! Yep, they're original. They were ensconced in copious layers of Waxoyl and don't seem brittle or cracked. Given that there's no engine in the car and no transmission I figure I can take risk in this area until down the road. 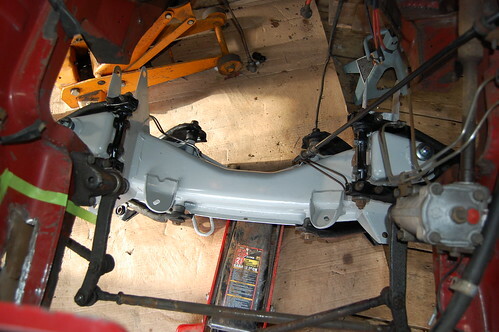 Brake lines sorted out on the passenger side and calipers and lines are all set on the driver's side. Have a long weekend and planning to tear down the rear suspension and yank the rear axle so the rear end can be cleaned up and all fully sorted. If I really get ambitious I may drop the fuel tank and start sorting out the fuel lines too.....we'll see. Wow, looking so clean, I can't wait to see the whole car finished up like this! Discovered a convenient access point to inspect the passenger side rockers. Stuffed my handy HF inspection cam in there and was really pleased to find that they're solid as far forward as the camera can reach. Definitely good news. I plan to shoot them with Eastwood frame sealer before this spot is sealed up again. Here's the liberated rear axle. Based on the jelled grease on it's belly and the splashes on the underside the body it seems like the pinion seal definitely needs replacing. Probably will do the seals for the axle shafts as well. Planning to clean, blast, and then paint the whole assembly before I re-install it. Also will open up the diff and put a new gasket on it. 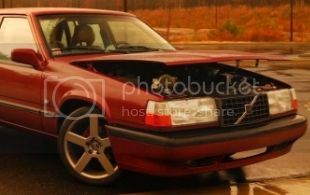 Decided to take the time to document the state of the driver's side rockers while I was shooting the other photos. Not good. The only good news on the driver's side is that (based on the inspection cam) it looks like most of the outers are solid. Brakes back here will obviously need to be re-done. The calipers aren't seized but the rubber around the pistons is cracked and split; will probably get rebuilts. The soft lines look amazing - soft, no cracks, not spongy...but they're plugged solid. Even compressed air won't clear them out; so they'll be replaced too. Not sure how to inspect these things to make sure they're good. First thing I'll do is blow air through the lines from the engine bay and see if anything comes out this end. Anyone have advice? Tomorrow I plan to get the torque and support rods off the body/axle assembly. Monday I may drop the fuel tank so that I can start looking for a place to clean and seal it. One of the support arms was seized up on the axle side and one of the torque rods had seized up bolt on the chassis side. The bolts basically were fused with the metal sleeve in the bushing. Even getting the bolts glowing cherry red didn't free them up. This is what they looked like after a lot of time with a good old fashioned Sawzall and a bunch of different blades. It may look like it was a lot of fun, but that's deceptive. They're not in bad shape at all...most of the scale looks like it will blast off quickly without a lot of pitting. Most of them are still covered by Waxoyl and in good shape. This isn't relevant to anything in particular but I just love the look of the car and couldn't resist. Continuing to plug along despite the frigid temps. Pulled the fuel pump mounting bracket with the pump still on it. I just cut the old lines since they're toast. The line feeding the pump was quite a sight....the inside is absolutely solid with what looks just like half-cured tar. Figured I'd deal with the scale and rust now that everything's as accessible as it's ever going to be. It did an OK job of containing the media and dust so that cleanup afterwards wasn't a nightmare. It sure wasn't pleasant crawling around under there with a worklight, sandblaster, and wearing fogged up goggles over glasses and a respirator. I'll be picking media out of my eyes and ears for days. This is the passenger inner rear quarter and frame rail middle through blasting the light scale. All of the rust here (and on the other frame rail in the tub) was just light surface stuff. Where the original undercoating was intact I just left it. This car will not be driven in bad weather and will be garaged....no way I was going to try to remove all of the old Waxoyl. Next photos are of the blasted areas after two coats of Rust Destroyer. After it has a good long time to dry (i.e. next week) I'm going to shoot it with Rustoleum flat black so that it blends in with the old undercoating. May shoot some rubberized undercoating on top of that down the road as well. Inner side of the rear valence is perforated toward the driver's side. Most likely I'll leave it this way until after the car is on the road. New paint isn't in the budget for this year and the outer side of the valence is also in need of patching so I'll probably have this taken car of when the car goes in for paint. Remainder of inner valence had only surface rust on the underside....of course there's no way to see the other side of it. 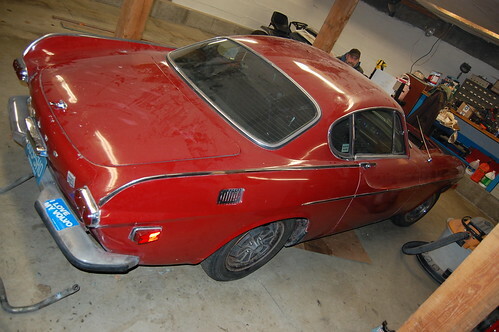 The inner/under rear quarter pieces on both sides are also nice and solid and had only light surface rust. This is the passenger side. I still need to blast the frame section up above the rear axle on the passenger side and inspect and possibly blast the inner/under rear quarter on the driver's side. I just had had my fill of blasting before I got that stuff done. Nasty work. If anyone in the northeast can recommend a shop that does gas tank repairs and sealing I'd appreciate it. Otherwise I'll start searching on my own (when I tried to find a shop to work on the tank in SENF I never did find anyone local and ended up buying a cheap aftermarket tank. That's not in the budget for this project since there do not appear to be any cheap tanks for these things. Temperatures soared into the low 40s here today; time to media blast! If anyone knows what that tag indicates I'd appreciate the info. That wet spot toward the bottom is from a pinhole in the diff cover that the blasting uncovered. It's toward the top of the cover....what to do? I broke this weld when trying to punch out the seized up bushing bolt. Then I dug into it with the sawzall cutting the bolt off. Next steps will be to get the rear suspension pieces out for new bushings and to pull the axle shafts for new bearings and seals and finish cleaning up the pie plates. 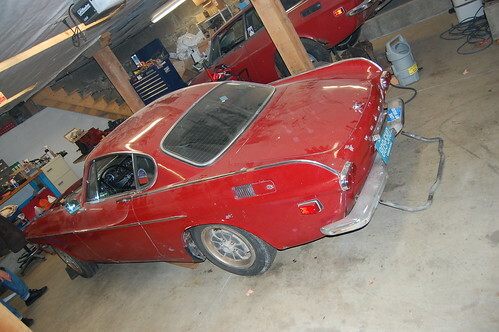 My goal is to get the rear suspension back together by the end of February....time and funds permitting. Gas tank will go to a shop in upstate NY for cleaning in March. 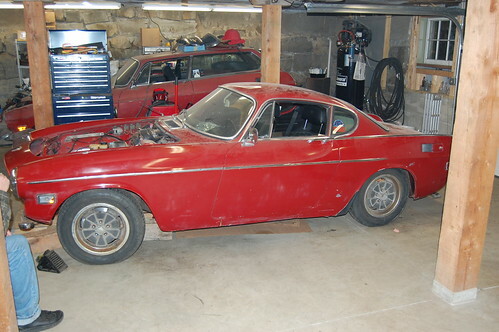 Hoping to be able to move on to the engine re-build by April. The tag indicates the number of teeth on the ring & pinion gears and the final drive ratio. 43 teeth on the ring gear, 10 on the pinion. 43/10 = 4.30:1.